Nonna Box is an Italian gourmet food subscription that brings authentic Italian flavors from a specific region of the country for only $69.95 per month. You’ll get a box of 6 full-size products that are hard-to-come-by and local to the region. 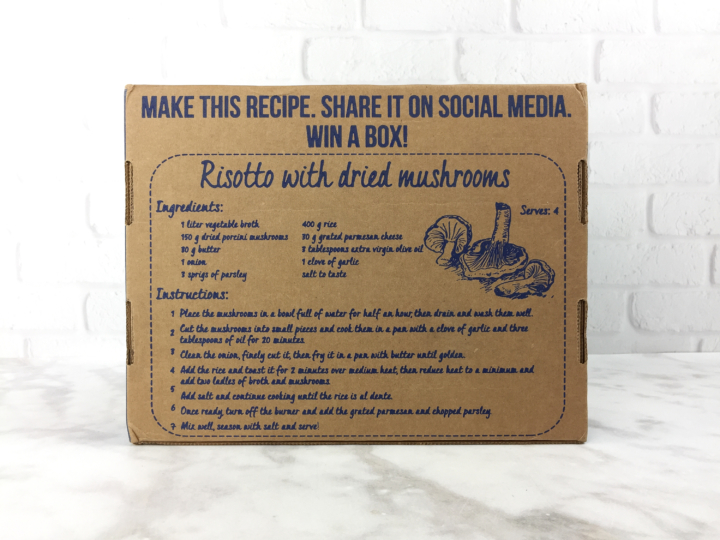 This month’s Nonna Box had an extra recipe right on the box! The Italian region of the month is Liguria, the Italian mainland’s westernmost coastal region! Sealed inside the Navy blue envelope are several info cards. 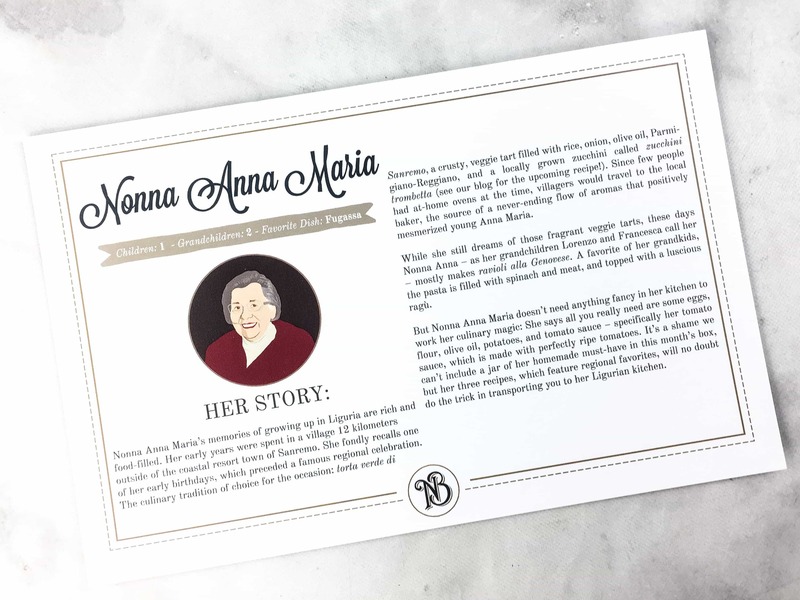 This one tells you more about the story of Nonna Maria’s Ligurian Life. Each edition of the box features a different region of Italy, enlisting the help of a local Nonna to share nostalgic memories, locale custom, and a few of her favorite recipes! 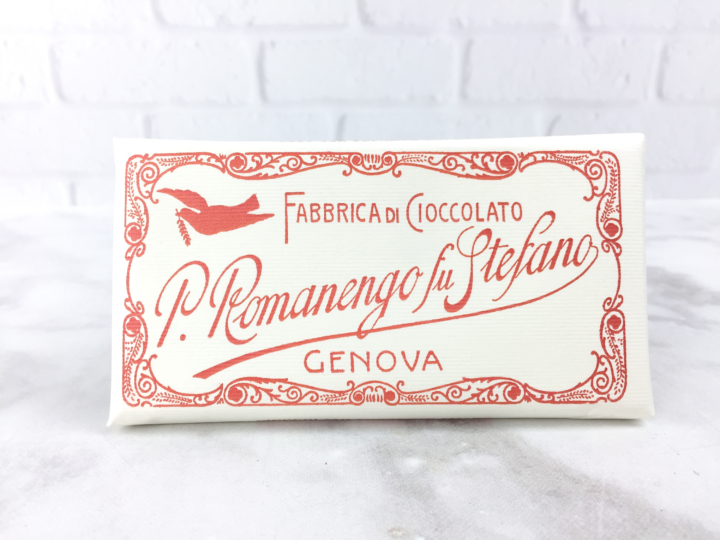 The back shows a silhouette of Liguria, identifying the origin of each item in the box. 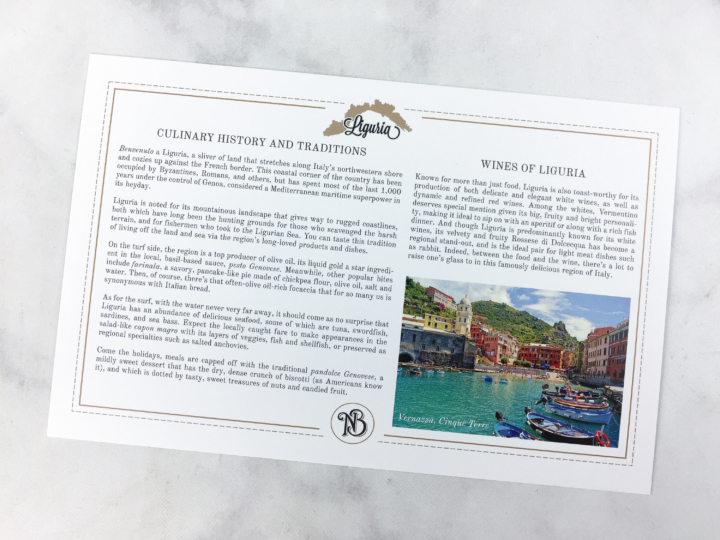 Another card shares some Ligurian history, highlighting the region’s fame for fantastic wines from the region. 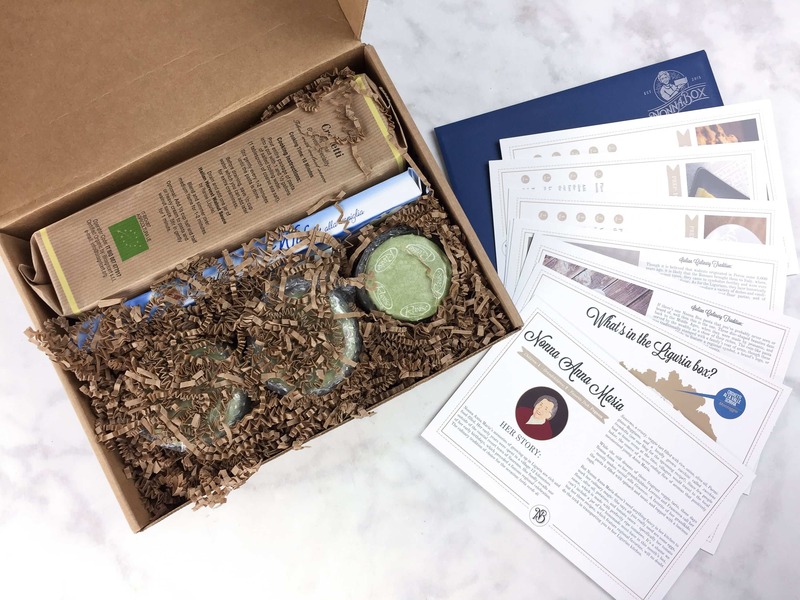 There are also several double-sided cards that provide a not-so-short description of the items in the box, with an emphasis on the cultural significance of the product. The cards describe how the food fits into the local culture, share a bit about the brand included in the box, and tell you how the locals like to eat it. 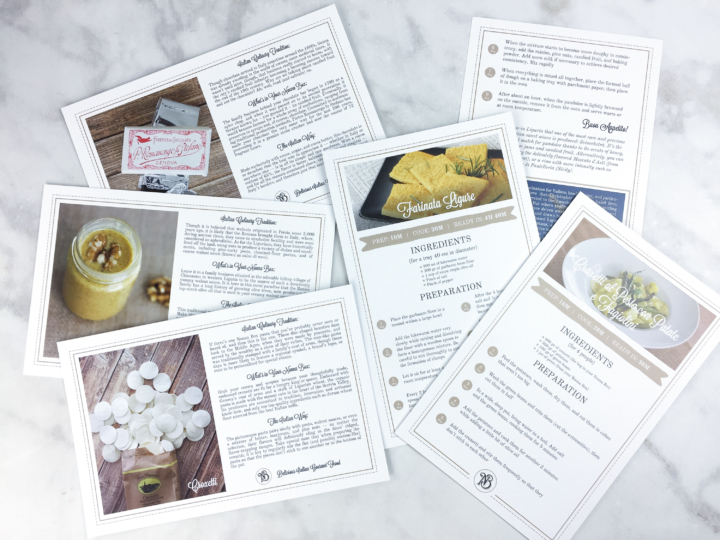 Then, there are several recipe cards to fully immerse you in the cuisine of the region. The recipes are suggested by the local Nonna, and they incorporate the products in the box. At the end of each recipe is an additional blurb and photo sharing even more about the region. They pack alot of culture and history into the box, and it really helps in seeing how the products are meaningful to the locals. 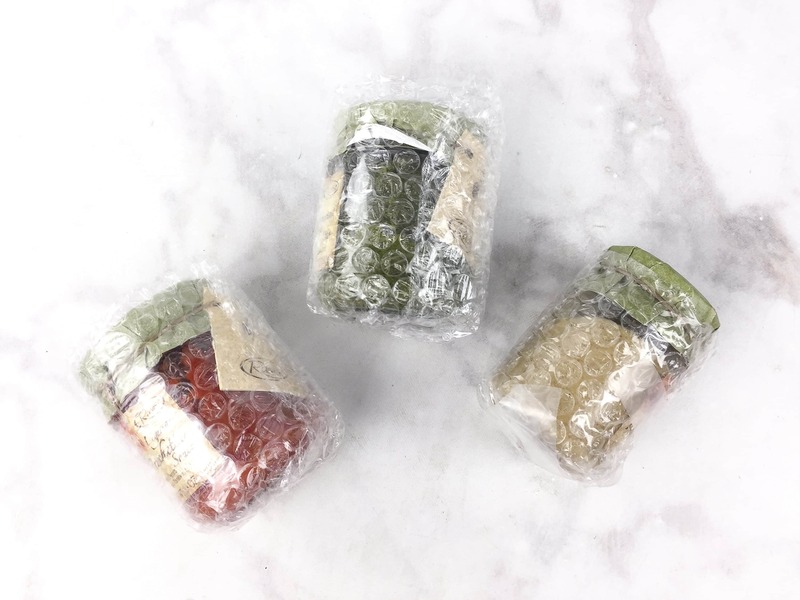 The few items that come in jars are well-protected with bubble wrap. 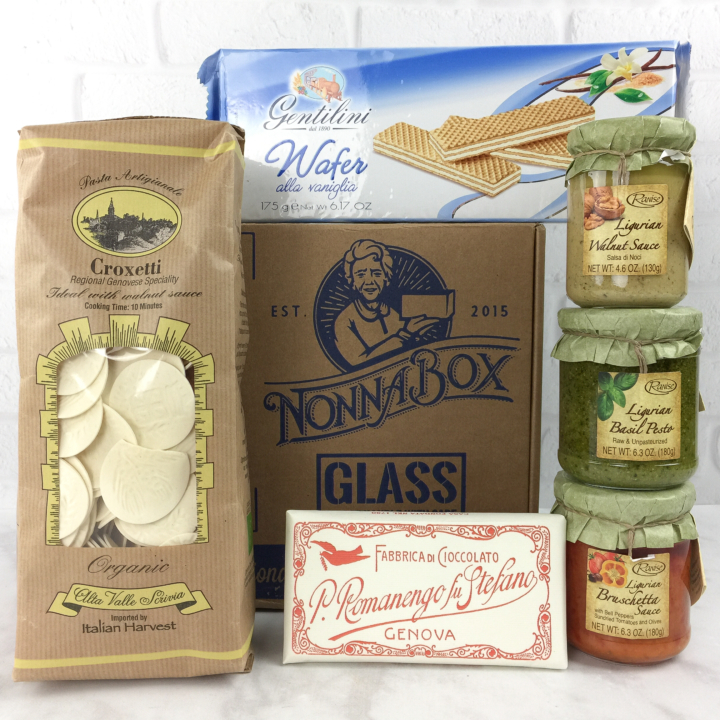 All the products in my March Nonna Box! 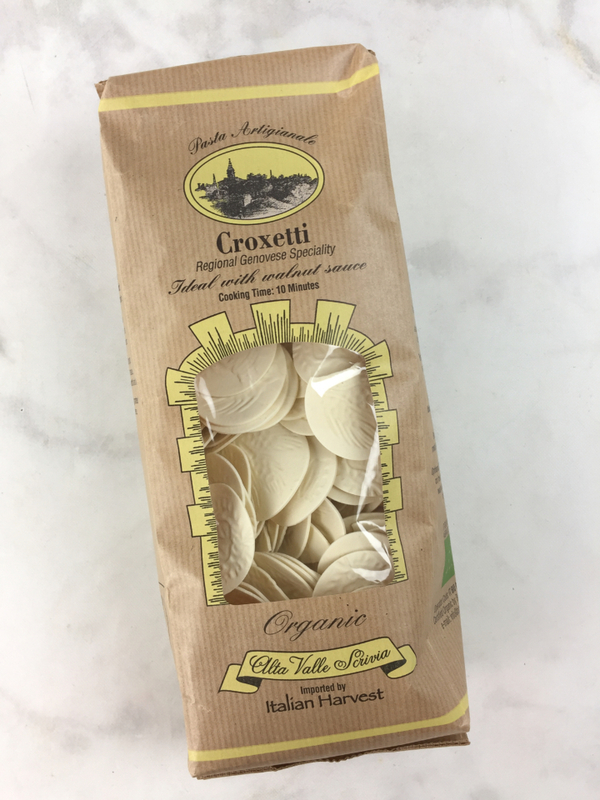 Alta Valle Scrivia Croxetti: This unique pasta look a bit like communion wafers with pictures stamped on them. The shape originated in noble houses of Genoa as a way of impressing guests by incorporating the family crest into the meal. I love the selection of a pasta with a local history and origin. The package says that it is ideal with walnut sauce. 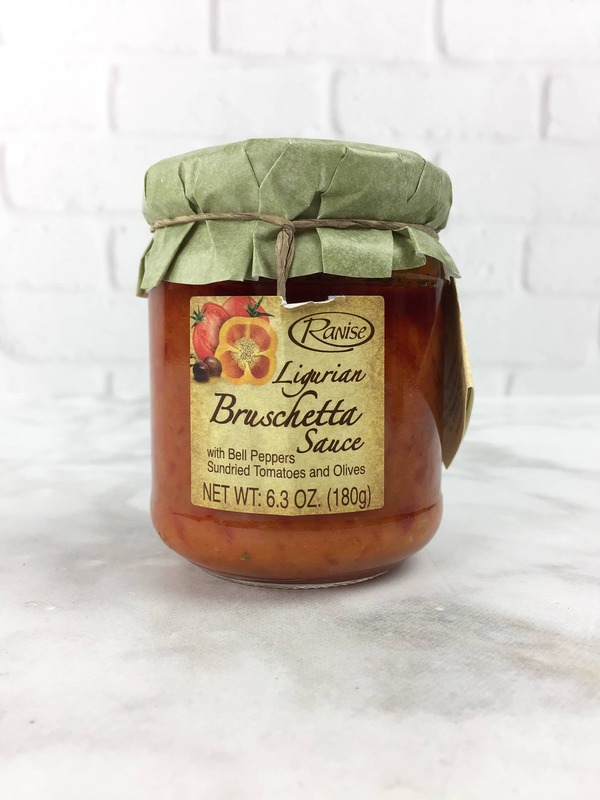 Lucky for us, this month’s Nonna Box included a jar of walnut sauce, another regional favorite.The pasta maintained a nice al dente texture, and I was pleased to see that it did’t fuse together at all during or after cooking. 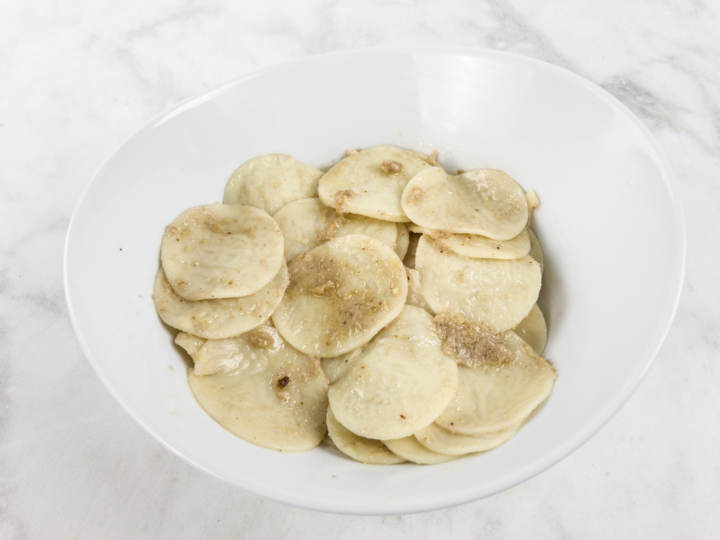 They were quite a bit like ravioli, but with no filling. The stamped design became less distinct after being cooked. Romanengo Chocolate Bar: This Genoa-made bar of chocolate comes in an elegant, mon0tone wrapper. The ingredients list is short and simple, as there are no extraneous elements in the bar. 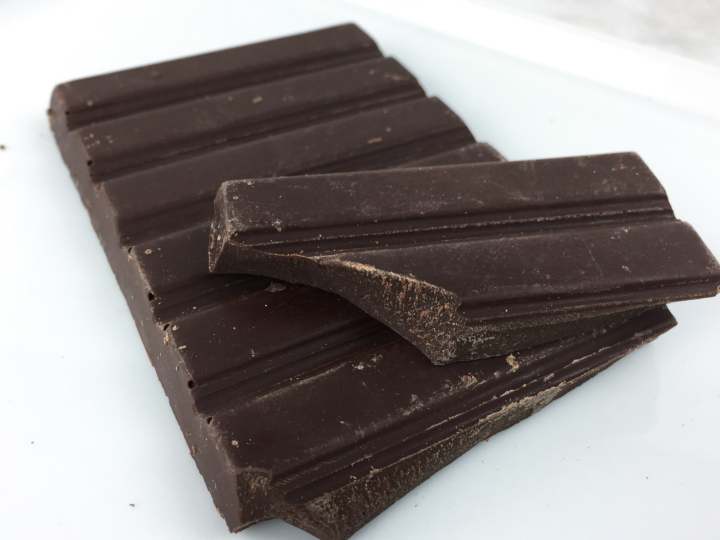 At 63% cocoa it is fairly dark, but still great as an eating bar. I like the taste of this chocolate. Though not labeled as such, it has a very “single-origin” taste, with lots of fruity and floral tones. It doesn’t have too much sugar, either – just enough to balance out the bitter of the chocolate without actually making it sweet. 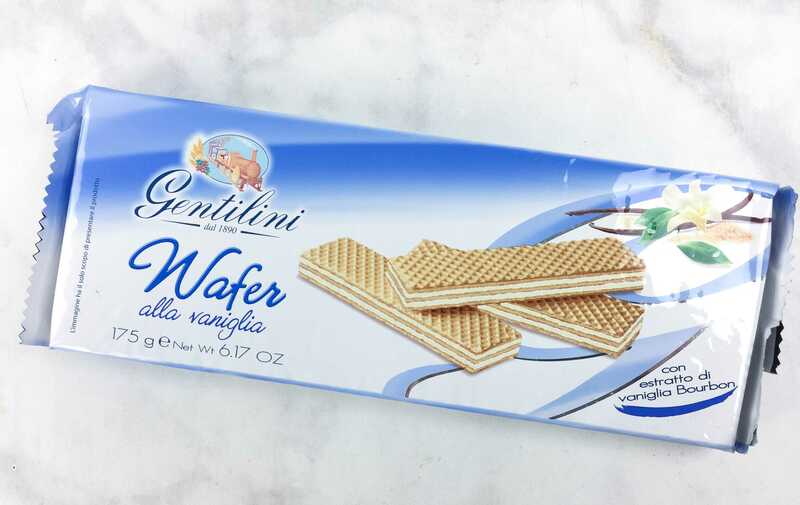 Gentilini Wafer alla Vaniglia (€1.29, about $1.40): These sweet wafers are a mild and delicate snack. 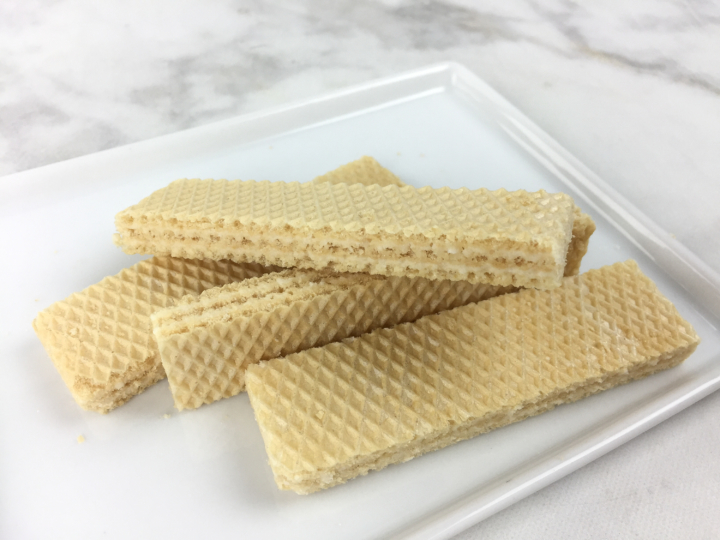 Unlike most wafer cookies of this type, the emphasis is on the vanilla flavor and not having a thick creme layer. The filling layers are fairly thin, absorbed partially into the surrounding wafer. They add sweetness but don’t dominate the wafer. Very crisp and delicious. 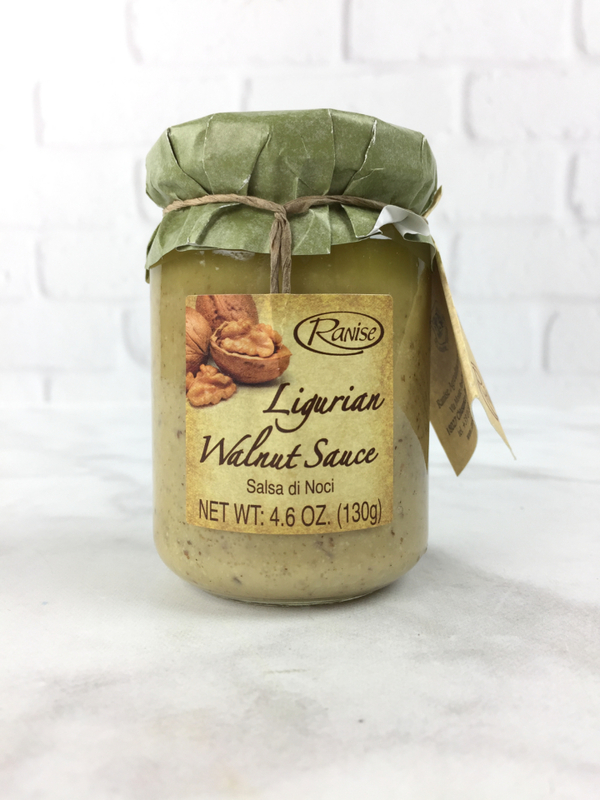 Ranise Ligurian Walnut Sauce ($10.50): This rustic-looking sauce is a Ligurian classic. 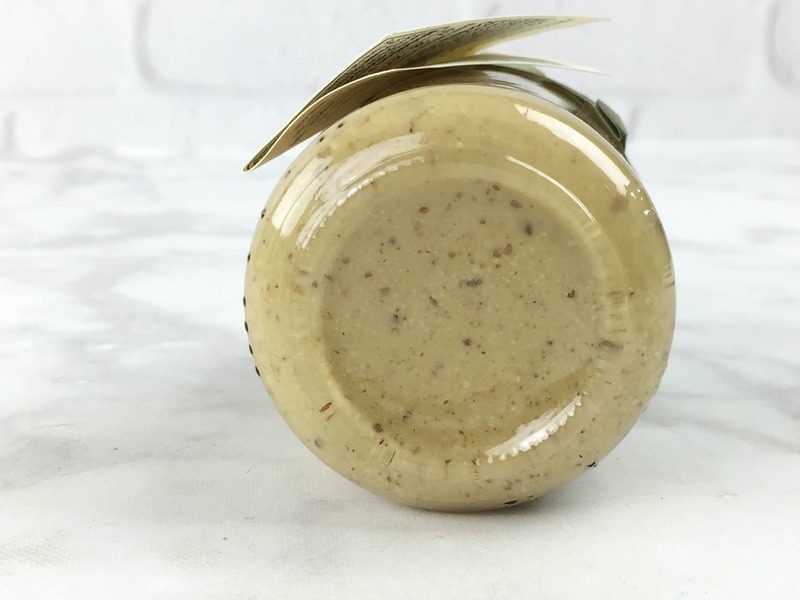 You can see the bits of walnut, and the sauce draws its color from the pureed nuts. 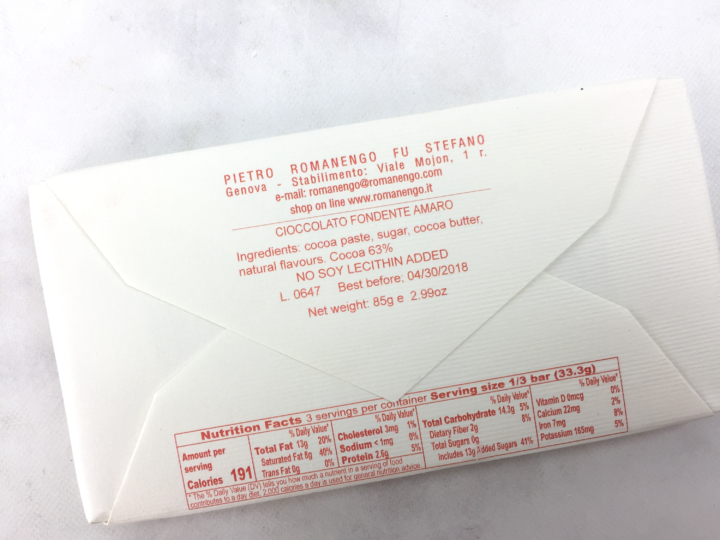 We served it with the Croxetti pasta, as suggested on the packaging. It was a delicious combo – the walnut sauce was delicate and wasn’t either sweet or bitter- it just had pleasant nuttiness. 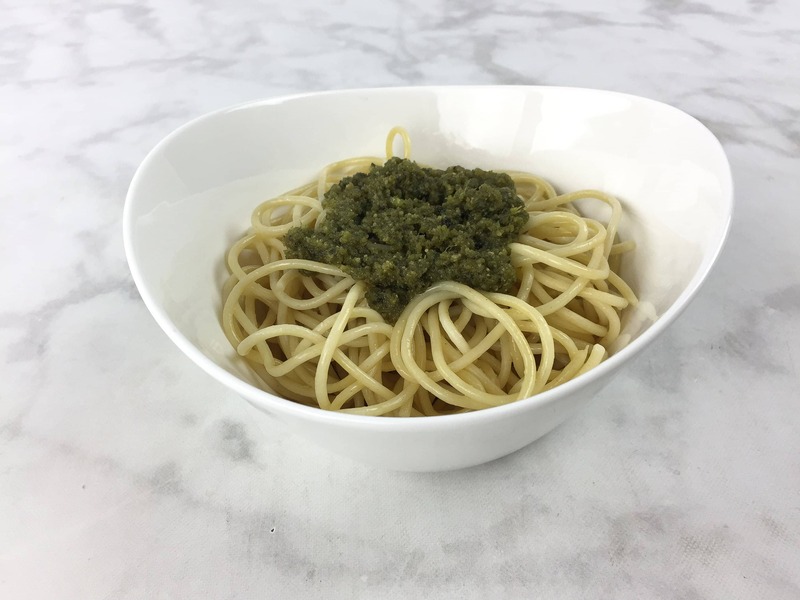 You get the same kind of richness that pignoli or nuts add to a pesto, but the emphasis is on the creaminess and not the brightness of the flavor. 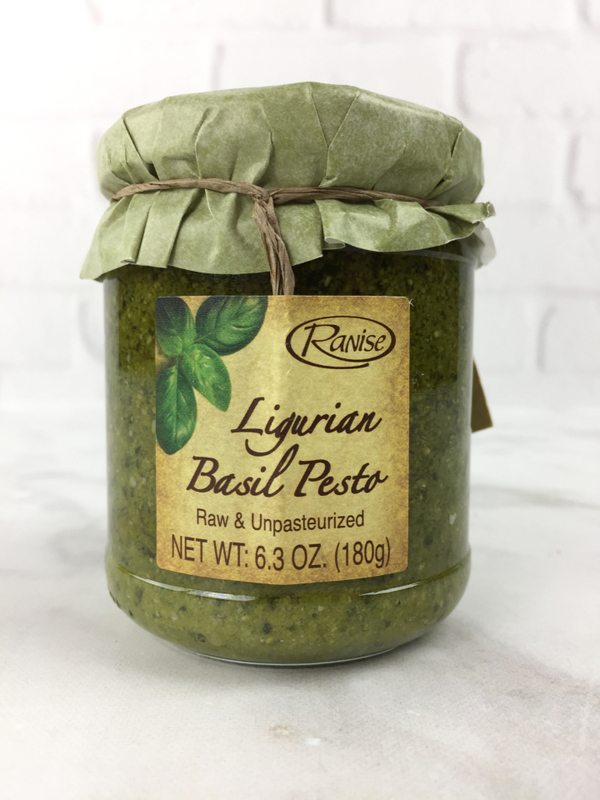 Ranise Ligurian Basil Pesto Sauce ($7.15): I think its great that Ranise offers multiple local favorites. 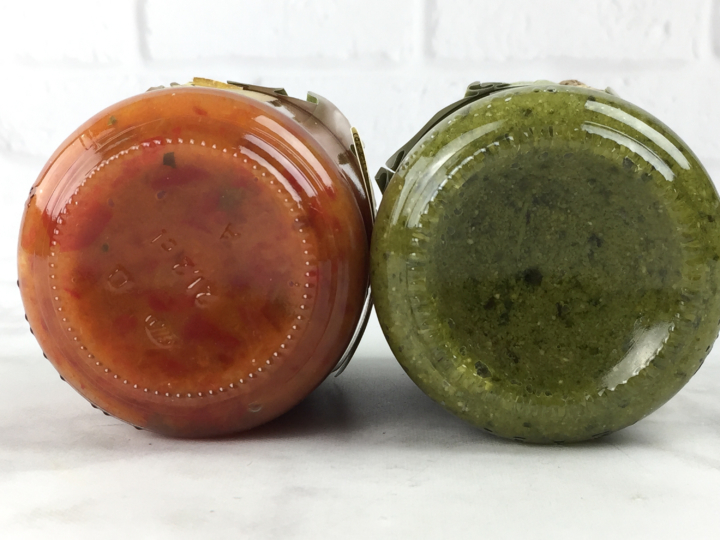 The Ligurian region claims to have originated pesto, and this jar contains a very flavorful version of the popular sauce. Ranise Ligurian Bruschetta Sauce ($11.50) Also included was a chunky Ligurian version of bruschetta. This one is made with bell peppers and sundried tomatoes, as well as olives. This picture shows the contrast between the chunky bruschetta and the finer pesto. When slightly heated, the basil and nuts in the pesto really soaked up the olive oil, so much so that it perched atop spaghetti. 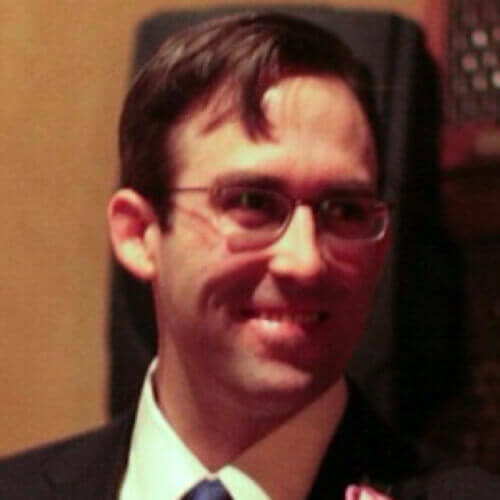 It did coat really well, though, once stirred in. 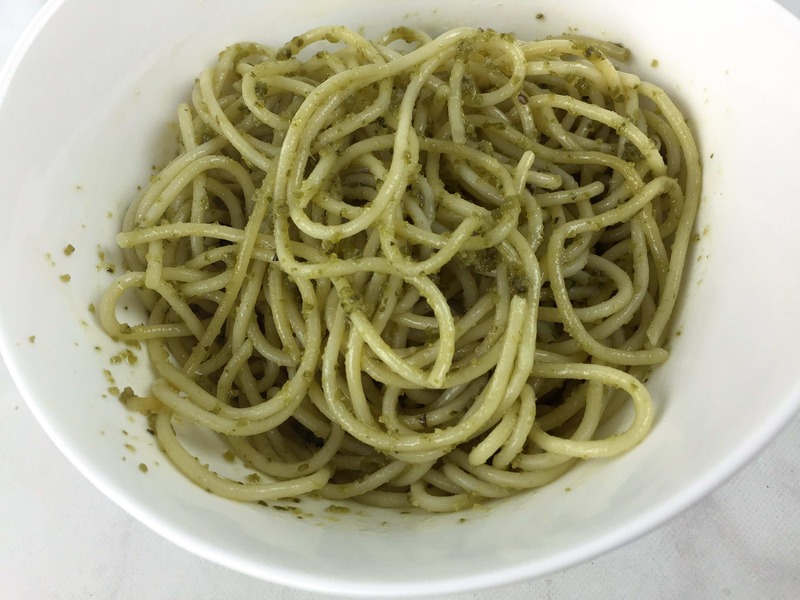 The flavor was very nice, with a good balance between the green of the basil and the richness of the nuts and oil. 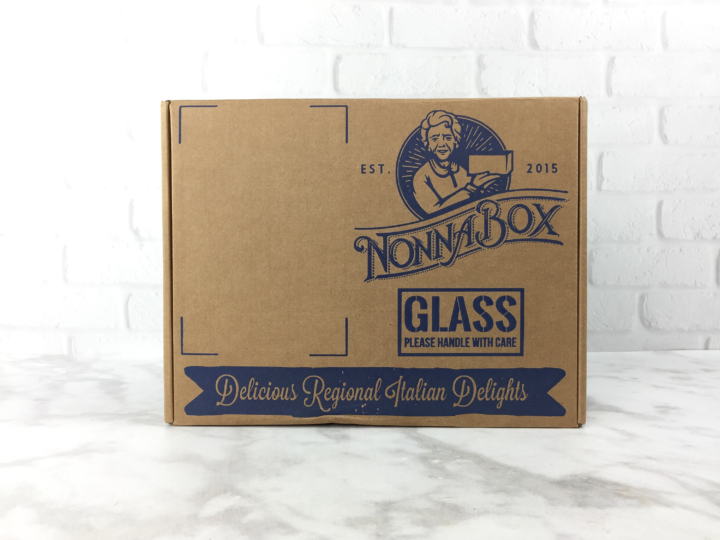 Nonna Box continues to impress with its intense focus on culture and tradition. 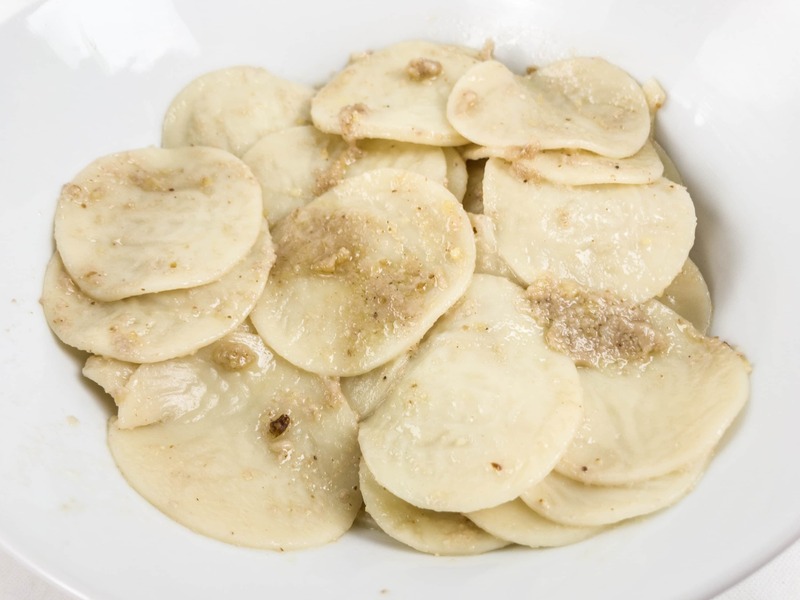 Each item is grounded in the food history of the region, and the monthly local nonna, along with her recipes, creates a palpable link between the produce of the region and the way in which the locals prepare and consume it. It is nice to have several recipes to make, though some are fairly complex. The box has a very authentic feel, shown by the reverence for local food culture and the deliberate avoidance of a scattershot pan-Italian take on Italian food. 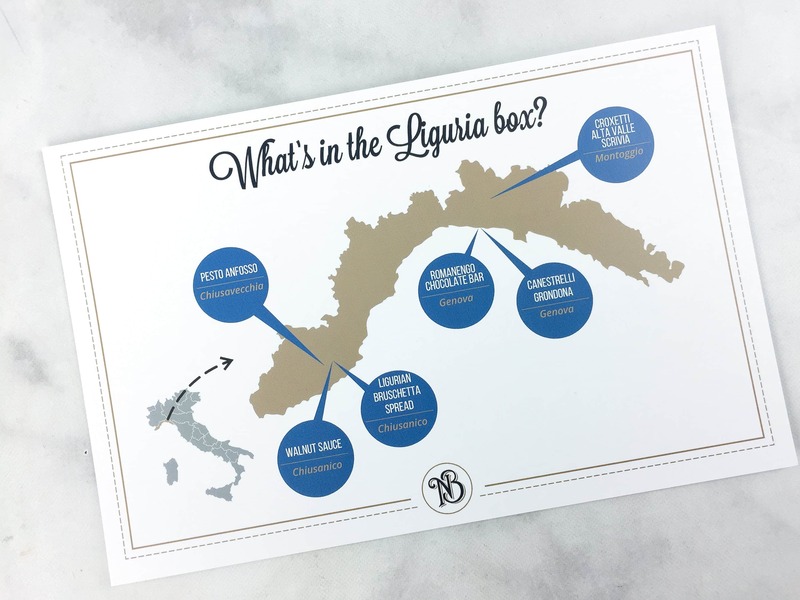 In this particular box, they found regional specialties and even included locally-produced versions of products enjoyed throughout Italy (and the world), offering three Ligurian versions of sauces that have become popular worldwide.